The name Chandeleur was well-suited for the islands that would be home to three lighthouses, each standing as a giant candle at the northern end of the island chain. The outline of the Chandeleur Islands has been aptly described as “a crescent moon in the final phase, a sandy arc extending north and south, bulging eastward at the center.” This prominent string of islands is located roughly sixty miles east of New Orleans and thirty miles south of Biloxi. Ships headed to New Orleans via Lake Pontchartrain and the Rigolets, pass just north of the islands, while those bound for the mouth of the Mississippi pass south of the islands. On March 3, 1847, Congress appropriated $12,000 for a lighthouse on the Chandeleur Islands, and a brick tower went into service in March 1848. The tower rose to a height of fifty-five feet and displayed a fixed white light using nine lamps set in fourteen-inch reflectors. The station must not have been a very desirable one as three different keepers cared for the light in its first year of service. The lighthouse’s existence was cut short in August 1852 by a hurricane that swept over the islands and toppled the lighthouse. Congress appropriated $15,000 on March 3, 1853 for a replacement tower, but the worst outbreak of yellow fever in the history of New Orleans disrupted the project, and the tower was not completed until 1855. The second tower, constructed of brick and shown at right, exhibited its light from a fourth-order Fresnel at a focal plane of fifty feet. The keeper’s dwelling, located near the tower, stood atop five screwpiles. 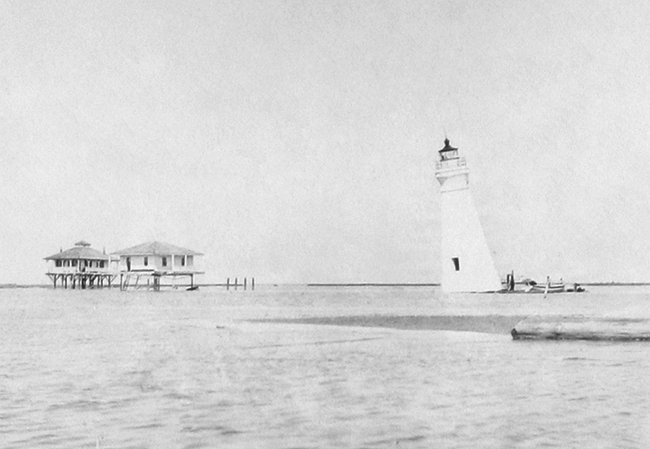 During the Civil War, Union forces captured Chandeleur Island Lighthouse in 1861 before the Confederates had time to remove its lighting apparatus. The commanding officer of the USS Massachusetts reportedly removed the lens but it was returned to the tower and activated later in 1861, making it the first light on the Gulf of Mexico to be relit by Union forces. Sailors from Union warships cared for the light until John H. Edler, a civilian, was hired as keeper. His loyalty to the North was questioned when it was reported that a Southern blockade-running vessel was receiving assistance from signals displayed from the tower. Edler was reprimanded but allowed to retain his position after swearing his allegiance to the Union. The old Light has been almost completely wrecked. The foundation has given away on one side and the old brick tower has begun to lean greatly towards the sea. So great is the angle that it is dangerous for a man to enter the Tower. The Light itself is also damaged. The hurricane also destroyed a quarantine station that had been established on the island. Congress allocated $35,000 for replacing the tower on August 18, 1894, and a contract for a metal, skeletal tower was made in August 1895 and a separate contract entered into for erecting the tower in September. 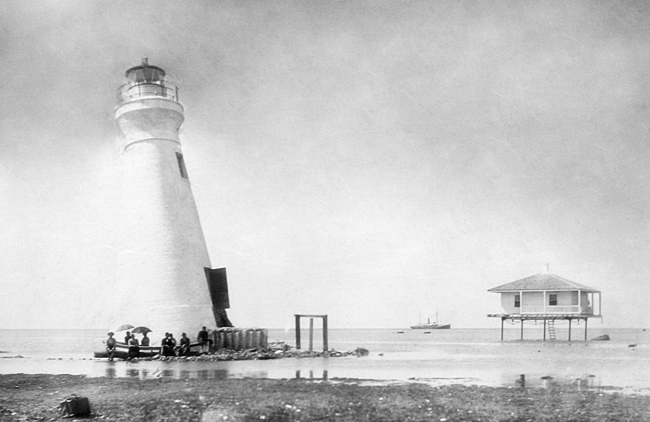 The lighthouse was completed on August 25, 1896 and was painted “mineral brown,” with its lantern room black. The new lighthouse went into service on October 31, 1896, displaying the light from a third-order Fresnel lens at a focal plane of 102 feet, roughly twice that of the two previous towers. 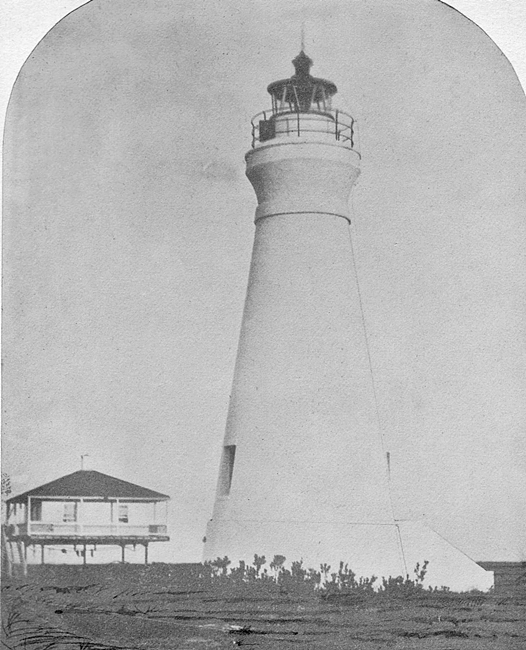 A temporary tubular lantern light, which had been displayed from a pole atop the roof of the station’s northern dwelling, was discontinued with the establishment of the new lighthouse. In 1898, galvanized wire netting was placed around the lantern room to protect its glass panes and lens from birds, and a 355-foot-long wharf was built from the dwellings to deep water in the adjacent bayou. A brick oil house was also added to the station the same year. In 1907, a third-order clamshell Fresnel lens, manufactured by Chance Brothers of England, was installed in the lantern room, and the characteristic of the light was changed to a red flash every ten seconds. In 1934, the characteristic of the light was changed from flashing red to flashing white. Four boat captains and Keeper William Heinemann accused Assistant Keeper Mathias W. Strickert in 1907 of locking his three young children in a foul outhouse and otherwise cruelly and inhumanely treating them. Strickert denied the charges and took his family ashore where Dr. H.M. Folkes of Biloxi examined the children and issued the following signed statement. These children are seven, five and three years of age respectively. They present no evidences of ill or brutal treatment. They are not as well nourished as the ordinary children of their age, but as they live on a desolate island twenty-five miles or so from any fresh food supply, this is readily understood. Their skins are brown, showing results of exposure to the fresh air and sunshine. Strickert was put on trial in New Orleans and acquitted. Though two witnesses stated they heard the heartrending screams of the children, no one actually saw the children being beaten. Strickert later served as keeper at Sand Island, Alabama. Keeper Heinemann drowned on April 2, 1908 when the station’s sloop capsized while the keeper was trying to reach Gulfport. The newspaper account of his death stated that Heinemann “had an enviable record as a life-saver and it is somewhat remarkable that a man who had saved so many others from drowning should, himself, meet his death in that manner.” Heinemann received a silver medal for saving the lives of thirty-four people who were thrown out of the schooner Gertie Rhodes in July 1905. In 1915, 1917, and 1918 Keeper William W. Bayly and his assistants were commended for maintaining the light under adverse conditions during a hurricane. Keeper Bayly was also recognized in 1915 for furnishing shelter to a woman and child from the schooner Madeline, which had gone ashore near the station. At around 5:30 a.m. on April 9, 1920 a tornado struck the station on Chandeleur Island. The fierce winds lasted for about five minutes and badly damaged the two square keeper’s dwelling near the tower. Half of the roof of the assistant keeper’s dwelling was blown off and struck the head keeper’s dwelling causing additional damage to it. In October 1923, “three men, exhausted, hungry, thirsty, with feet swollen so that walking was torture, staggered up to the Chandeleur lighthouse” and announced that they were the crew of the tugboat Bronx, lost at sea in a northeaster while making its way from Pensacola to Mobile. A fourth man, unable to complete the fifty-mile journey, was left seventeen miles south of the lighthouse and was later rescued. The men drifted eighty-two miles on life-rafts before landing on Chandeleur Island. By the time this photograph was taken in 1960, only one of the station’s two dwellings remained. The second dwelling was destroyed by Hurricane Camille in 1969 before this photograph was taken in 1971. Chandeleur Island Lighthouse was de-staffed sometime before 1950, as that year six fishermen sought refuge at the station where no keepers were present. In 1970, Foretich Marine Contracting of Gulfport was awarded a $47,000 contract to sandblast and paint Chandeleur Island Lighthouse and build a 1,000-foot pier southwest of the tower. The Chandeleur Islands create a buffer zone between the Gulf and the mainland, protecting the New Orleans area from the wind and storm surge associated with hurricanes. 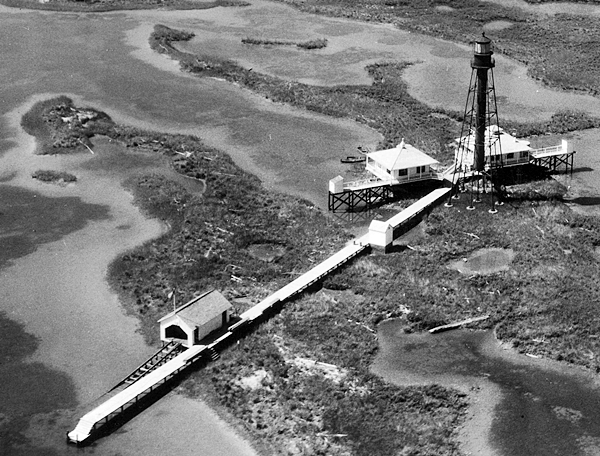 With nine spindly legs securely anchored to pilings and supported by a web of diagonal braces, the third Chandeleur Island Lighthouse managed to withstand several hurricanes and storms during its lifetime of more than a century, including 1969’s deadly hurricane Camille. In September 1998, Hurricane Georges impacted the Chandeleur Islands with winds of 100-110 mph and a storm surge of ten to twelve feet. The overwash from the slow moving hurricane cut what was an almost continuous strand of land into several small pieces. The land surrounding the lighthouse at the northern end of the island was washed away, leaving the lighthouse standing in open water. After the Chandeleur Islands migrated landward, Chandeleur Island Lighthouse was left alone, as a solitary candle on the water. 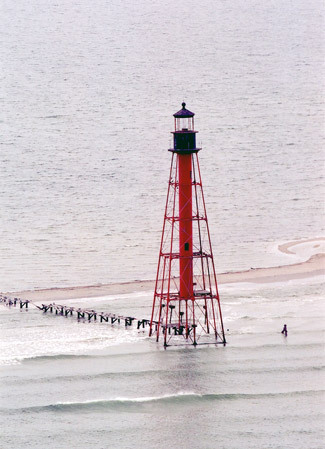 In the spring of 2005, the lighthouse was standing in three feet of water. 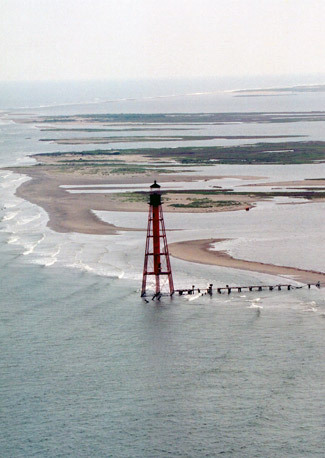 Hurricane Katrina, which struck later that year, toppled the exposed lighthouse. When a research team visited the islands in the spring of 2006, the depth of the water where the lighthouse formerly stood was found to be seventeen feet. The team could find no trace of the lighthouse even though the water was quite clear. Head: Vincent Roblain (1848), John Dupeire (1848), George H. A Tromblig (1848 – 1849), Alexander Lea (1849 – 1853), Eugene Sullivan (1853 – 1855), Benjamin F. Midgett (1855 – 1857), Peter Wilson (1857 – 1860), W.D. Martin (1860 – 1861), John H. Edler (1862 – 1873), James Holden (1873 – 1874), Henry Sherwood (1874 – 1878), Oscar M. Mitchell (1878 – 1886), Daniel A. Joyce (1886 – 1897), Thorwald Hansen (1897 – 1904), William Heinemann (1904 – 1908), Jacob M. Hansen (1908 – 1909), Sydney Gibbon (1909 – at least 1913), William W. Bayly (at least 1914 – at least 1921), C. Bateman ( – 1929), Will J. Laughlin (1929 – at least 1930), Irvin J. Stokes (at least 1935), W.D. Still (at least 1935), Ira D. May (at least 1937 – 1947). First Assistant: Marcomis Sturmey (1856 – 1857), Emile Desax (1857 – 1859), James Halden (1859 – 1862), Erasmus Lind (1862 – 1864), William Ison (1864), Henry Edler (1864 – 1871), George Edler, Jr. (1871 – 1873), Julius Opperas (1873 – 1874), James Wyman (1874), James Holden (1874 – 1876), William Eglinton (1876), A.K. 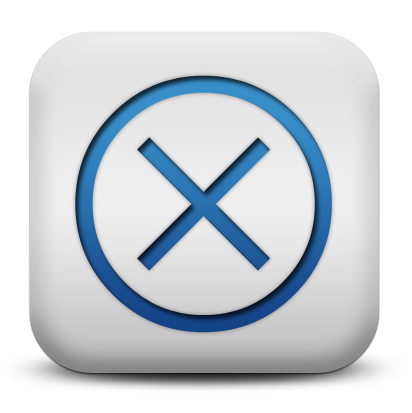 Aken (1876 – 1878), Oscar M. Mitchell (1878), B.F. Lindsey (1878), John Topp (1878), James G. Plunkett (1878 – 1881), Charles Chadwick (1881), Joseph P. Groux (1881 – 1882), George H. Shubert (1882), Lovance Smith (1882), George H. Shubert (1882 – 1883), Joseph P. Groux (1883 – 1885), Samuel Church (1885 – 1886), James G. Plunkett (1886 – 1888), Richard L. Powers (1888), Thomas N. Clarisse (1888 – 1889), William Douglas (1890), John Anderson (1890 – 1891), Patrick Melheran (1892 – 1895), Charles P. Sillinger (1895 – 1896), Thomas Ronan (1896 – 1897), Charles Ackley (1897 – 1899), William Hall (1899), Epps Danley (1899 – 1901), Charles J. Holmgren (1902), Charles M. Jones (1902 – 1903), Christopher M. Sterry (1903), Ralph Gordon (1903 – 1904), Mathias W. Streckert (1905 – 1907), Ramie M. Lassabe (1907 – 1908), Frederick A. Schrieber (1908), Albert B. Modawell (1909 – 1910), John A. Richards (1910), Max Wraa (1911), Charles M. Teller (1911 – 1912), Frederick A. Schrieber (1912 – at least 1913), Arthur J. Garland ( – 1915), Maurice Durabb (1915 – at least 1917), Mack W. Hamm (1917 – ), Walter H. Stone (1926 – 1927), Harvey J. Beebe (1929 – 1930), William W. Delong (at least 1935 – 1938), Wilbur D. Bardwell (1938 – at least 1941). Second Assistant: Thorwald Hansen (1908), Arthur B. Hobden (1908), Frederick A. Schrieber (1908), Joseph W. Sprinkle (1908 – 1909), Frederick A. Schrieber (1909 – 1910), J.A. Richards (1910), Junius L. Arroyo (1910), Leland D. Goodson (1911), Porter H. Champlin (1911), Oscar B. Tally (1912), Maurice Durabb (at least 1915), Stephen Coludrovich (1915), Junie C. Welch (1915 – ), Mack W. Hamm ( – 1917), Joseph C. Seidule (1917 – 1918), John Lettich (at least 1919), Charles W. Robbins (1926), Claude H. Stone (1926 – 1928), Harvey J. Beebe (1928 – 1929), Richard N. Besselaar (1929), Herman E. Bosarge (1929 – 1934), William Rabon ( – 1935), Wilbur D. Bardwell (1935 – 1938), Samuel Williams (1938 – 1944). “Strickert Denies The Story,” The Biloxi Daily Herald, August 24, 1907. “Shipwrecked on Chandeleur,” The Biloxi Daily Herald, October 11, 1923. “Captain William Heinman Drowned,” The Biloxi Daily Herald, April 4, 1908. 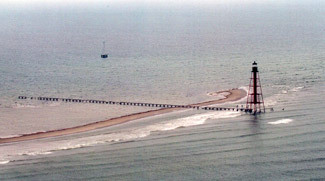 Before being destroyed by Hurricane Katrina, Chandeleur Island Lighthouse was located near the northern end of the Chandeleur Islands, twenty four miles south of Biloxi. The Chandeleur Islands are part of the Breton National Wildlife Refuge. For a larger map of Chandeleur Island Lighthouse, click the lighthouse in the above map. Chandeleur Island Lighthouse was destroyed by Hurricane Katrina in 2005. 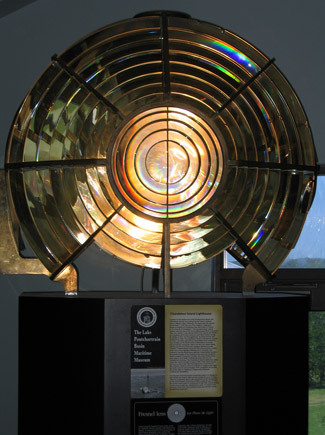 The third-order clamshell Fresnel lens used in the third Chandeleur Island Lighthouse can be seen at Lake Pontchartrain Basin Maritime Museum in Madisonville.